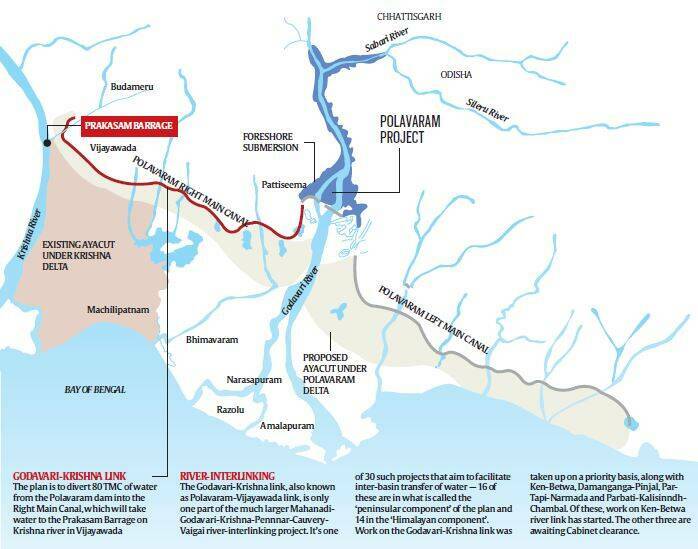 On Wednesday, after flowing 124 km, water from the Godavari river in Andhra Pradesh reached the Krishna delta region, marking a milestone in the river-interlinking project. On September 15, the Godavari water, after flowing for 174 kms will reach Prakasam Barrage, the dam on river Krishna at Vijayawada. * 3,000 TMC of the Godavari’s flood waters flows into the Bay of Bengal every year. Successive Andhra Pradesh governments have been trying to harness at least 10 per cent of this water and divert some of it into the Krishna, whose delta faces an acute shortage of water for irrigation from June to August. * While the plan is to eventually divert water from the Polavaram dam, since the dam is still under construction and will take at least 4 to 5 years to be ready, the Chandrababu Naidu government decided to divert Godavari water from the Pattiseema Lift Irrigation Scheme. This plan will kick off on September 16. For now, since September 1, the government has been carrying out a trial run, pumping water into the canal from the Tadipudi lift irrigation project of the Godavari. It’s this water that will enter the Krishna delta on September 15. Pattiseema is a village in Polavaram mandal of West Godavari district. 80 TMC of flood water from the Godavari at this point will be diverted into the Polavaram Right Main Canal, which is nearly complete up to Prakasam Barrage on river Krishna at Vijayawada, 174 km away. But this water has to be lifted from the Godavari at Pattiseema and pumped to the Polavaram Right Main Canal, 3.9 km away. * Rs 1,427 crore is the cost of the Pattiseema project, which was approved on January 1, 2015, and work on which began on February 23. * 80 TMC of Godavari water in the Krishna delta means the pressure to supply water from river Krishna eases and the Krishna water can be saved and stored at Srisailam dam, from where it can be supplied to the drought-prone Rayalaseema region.